The Iranian government must understand that the world is watching. We mourn each and every innocent life that is lost. Translated from French by Patricia Simoni. Edited by Jessica Boesl. Posted on June 22, 2009. After maintaining a low profile, President Obama has changed his tone. On Saturday, the American president called upon the Iranian government "to stop all acts of violence and injustice against its own people." “The Iranian government must understand that the world is watching. We mourn each and every innocent life that is lost," was the statement released by the White House. “The universal rights to assembly and freedom of expression must be respected, and the United States stands with all who seek to exercise those rights," he added. 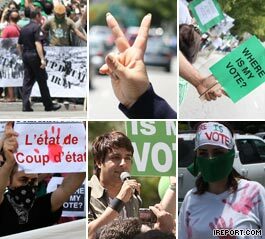 At the same time, several hundred demonstrators gathered outside the White House in Washington, as well as in New York and Los Angeles, in support of the protests in Iran. This development comes as the debate about how to deal with events in Iran raged for several days in Washington. Barack Obama was facing severe criticism for his remarks, which were deemed to be too "tepid." Last Tuesday, the fourth day of demonstrations in Iran, he said he had "deep concerns" about the presidential election of June 12, but felt it would be "not productive" for the U.S. to meddle in Iranian domestic politics. All last week, the Republican opposition rallied to deplore the "silence" of the president and to urge him not to miss a historic chance. “No comment is not an option," said former Assistant Secretary of Defense Paul Wolfowitz, in an uncompromising article published by the Washington Post. Friday evening, the two Houses of Congress finally voted, by overwhelming majority, for a resolution supporting Iranians “who adhere to the values of freedom and human rights.” In an interview with CBS News, Obama then warned the Iranian government “that the world is watching." However, he is holding back from condemning Iranian power or denouncing electoral fraud, as are several European leaders. Even if he is well aware that he cannot remain passive in the face of the dramatic turn of events, President Obama remains committed to a cautious position, judged to be too “timid" by his Republican opponents. This is explained by at least two reasons. First, there is fear that these events reinforce accusations that opponents of Mahmoud Ahmadinejad are "pro-American" at a time when relations with Washington remain a subject of extreme sensitivity in Iran. The central issue of nuclear power also justifies the cautious attitude of President Obama. People in Washington remain convinced that Hossein Moussavi remains as committed as Mahmoud Ahmadinejad to the continuation of a nuclear program, which ultimately rests in the hands of Ayatollah Ali Khamenei. Moreover, the decision of the supreme leader to validate the re-election of Mahmoud Ahmadinejad apparently led the head of the White House to kick his criticism up a notch, according to analysts in the American press. His Iranian policy, based on the gamble of extending a hand to Tehran, will not escape a reassessment, according to many of these observers.